Dorothea Lange was an American photojournalist and documentary photographer. She was widely known for the Depression-era job for the Farm Security Administration (FSA) that she did. Her photos humanized the outcome of the Great Depression. He work also influenced the growth of documentary photography. Dorothea was born in 1895 in New Jersey. She was named Dorothea Margaretta Nutzhorn when she was born, but she dropped the middle name and used her mother’s middle name when her father abandoned them when she was age 12. This was one of the most traumatizing moments in her life, along with contracting polio when she was seven years old. Polio left her with a permanent limp and a weakened right knee. Dorothea went to the Teachers New York Training School where she decided to become a photographer. This move was partly influenced by the visits to Arnold Genthe, a renowned photographer. 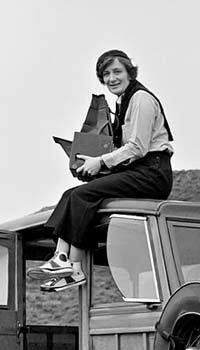 She studied a photography course which was run by Clarence White at the Columbia University. In 1918, Dorothea moved to San Francisco. She opened a successful portrait studio the following year. In the late 1920s, she was dissatisfied with her studio work and started to experiment with plant and landscape photography. She found it unsatisfactory. Dorothea turned to the effects of the economy decline after the crash of the stock market in 1929. She took photographs like General Strike in San Francisco in 1934 and her first one-woman show was done at the Brockhurst Studio. When the Great Depression started, Dorothea shifted her camera lens from her studio and took to the streets. The studies she did about homeless and unemployed people captured the attention of the local photographers. This caused her to get employed by the Resettlement Administration, which was later called Farm Security Administration. From 1935 to 1939, Dorothea’s work at the FSA brought the struggles of the forgotten and poor to light, particularly the sharecroppers, migrant workers, and displaced farm families. She distributed the images to newspapers in the country for free. These images became icons of the time. One of her brilliant and well-known photographs was from the project named Migrant Mother in Nipomo, California. It depicted a distracted and anxious mother with three children. She published a book entitled An American Exodus in collaboration with her husband, Taylor, who provided the text in 1939. This book dealt with similar social issues. Dorothea was given a Guggenheim Fellowship award in 1941. This enabled her to take photos of the religious groups in the United States. She released photographs of Mormons and of the rural life in Ireland. She also worked in the Middle East and Egypt producing photographs like Procession Bearing Food to the Dead in upper Egypt. It was done in a detached documentary style which was characteristic of all her works. Dorothea was married twice in her lifetime. The first marriage was to Maynord Dixon. When they divorced in 1935, she married Taylor Paul Schuster. She died in 1965 of esophageal cancer.